What Do You Do When An Automated Email Report Refuses To Email Itself? How Important Are Business Intelligence Tools? What is a Power BI Dashboard? Utilize SQL Server Reporting Services To Get The Most Out Of Technology! 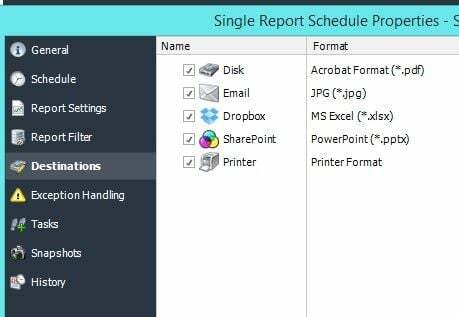 Do You Use A Dynamic Tool to Schedule Crystal Reports? Automated Reporting For SQL Server - What's the Point? Data Lake vs. Data Warehouse: Which One Do You Need? Do You Know How To Schedule SSRS Conditional Subscriptions? Are You Wasting Resources on Business Intelligence Reports? Can You Schedule Access Macro to Run Daily? Yes You Can! Why Should You Send An Access Report Via Email Automatically? How Can Self-Service Analytics Tools Help Your Business? Are You Getting the Most from Your Business Intelligence Tools? Who Should Use Query and Report Writing Software? What Are The Best Business Intelligence Solutions? What are Intuitive Business Intelligence Dashboards? How Do Business Intelligence Solutions Profit Businesses? How Big Data Is Changing Analytics For the Better! Do You Need Self-Service Or Automated Reporting To Be Successful? What Are The Benefits Of Big Data Governance? 3 Ways BI Software Keeps IT on Top Of Their Game! SQL Server For Linux? Here's Why This Is Huge!